The complex action on AK7Ch alloy by thermotemporal treatment and a flux containing 50% NaCl, 35% KCl, 15% Na2SiF6 allows controlling the heredity of melt from low-grade charge materials and producing an alloy with a required level of properties. Two molding sands were investigated on test benches with different compaction methods: pulse-filtration and impact loading. 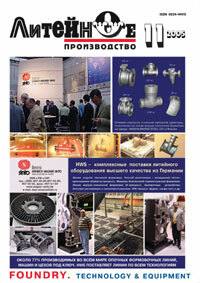 The main differences in the behavior of the molding sands and the advantages of each of the methods are discussed. Effect of activation of a complex organic binder on the strength of molding sand has been investigated, its effectiveness in core making has been shown. The manufacture of ceramic molds and cores by freezing water suspensions is discussed as a method that helps create an environmentally safe foundry and successfully competes with making cores from synthetic resin bonded sands. Effect of suspension composition, freezing, drying and calcining conditions on the properties of molds and cores has been investigated. A department for thermal reclamation of molding sand on a KTIAM-designed PT-1 unit has been installed. The physical-and-mechanical properties and advantages of molding sands using reclaimed sand have been investigated. The most important principles of automation of designing foundry equipment based on the main reliability indices, based on which a program complex has been developed, are discussed. Its use simplifies the compromise between the reduction of the less reliable of them.